1. French Open 2018: Halep Beats Stephens To Win Maiden Grand Slam Title. Simona Halep fought back from a set and a break down to finally claim her first Grand Slam title by beating Sloane Stephens 3-6, 6-4, 6-1 in a gruelling French Open final on Saturday. The world number one had lost all three of her previous major finals, including two at Roland Garros, but staged a thrilling comeback to win after two hours and three minutes. "In the last game I felt like I could not breathe anymore", said Halep. It was the perfect way for the Romanian to banish the demons of her painful final defeat by Jelena Ostapenko 12 months ago, when she blew a lead of a set and 3-0. US Open champion Stephens had looked set to lift a second Grand Slam trophy when leading 6-3, 2-0, but the American 10th seed wilted in hot conditions and Halep pounced. The 26-year-old played a scintillating deciding set in which she made only five unforced errors, breaking her major duck in style. Halep celebrated her victory in a way usually seen at Wimbledon, climbing into her box to greet friends and family. "I tried to not do the same thing as last year. It`s a dream and it`s so special to do it here in Paris," she said. 2. 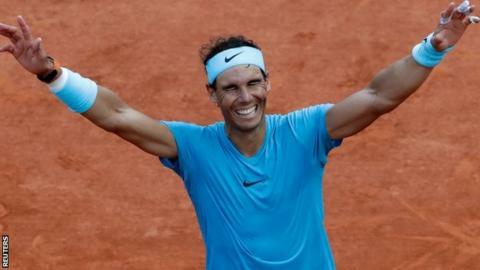 French Open 2018: Rafael Nadal Beats Dominic Thiem To Win 11th Title. In full control of the French Open final, a rather familiar position for him, Rafael Nadal suddenly was worried. He led by two sets plus a break early in the third, when the middle finger on his racket-wielding left hand was cramping so badly he couldn`t straighten it. After serving a fault, Nadal took the unusual step of heading to the sideline in the middle of a game. Up in the stands, Nadal`s uncle Toni, his former coach, was nervous, too, "because I thought maybe we can have a problem," he said. "But in the end, it was not too difficult." "There is a reason why he won 11 times here," said Thiem, a 24-year-old Austrian appearing in his first major final. "It`s definitely one of the best things somebody ever achieved in sport." Throw in three titles at the U.S. Open, two at Wimbledon and one at the Australian Open, and Nadal is up to 17 majors, second among men only to Roger Federer`s 20. The two stars have combined to win the past six Slams. The victory also allowed the 32-year-old Nadal to hold onto the No. 1 ranking, ahead of Federer. If there were any reason for a bit of intrigue entering Sunday, it was this: Thiem beat Nadal on red clay at Rome in May 2017 and again at Madrid last month. But those are not quite the same as the French Open, where Nadal is 86-2 for his career. 3. India Beat Kenya To Lift Intercontinental Cup Football Title. 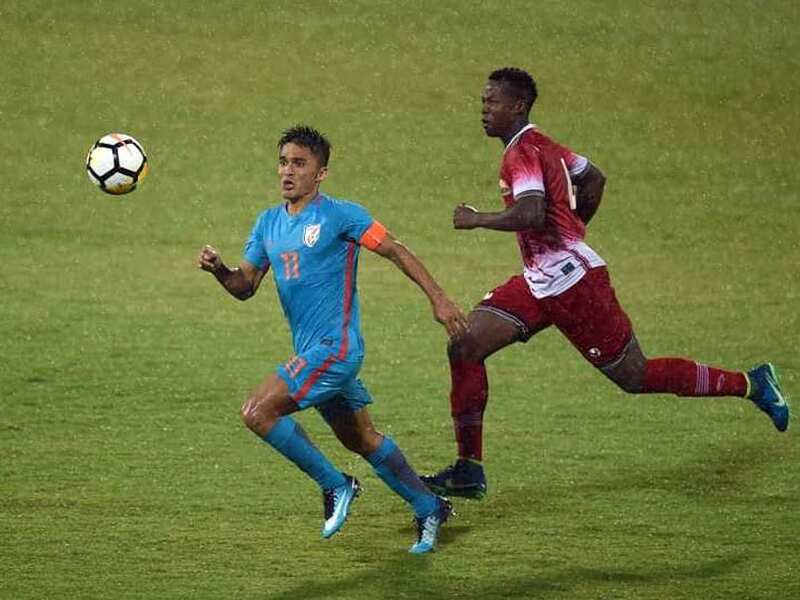 Skipper Sunil Chhetri continued his superb form, striking a brace as India thrashed Kenya 2-0 to clinch the Intercontinental Cup at the Mumbai Football Arena here on Sunday. Chhetri, who scored in the eighth and 29th minutes to hand India a convincing victory, also equalled Argentina`s Lionel Messi`s tally of 64 international goals, making him the joint-second active international goalscorer behind Portugal`s Cristiano Ronaldo (81 goals). With the stadium jam-packed with Indian fans, the hosts started on an aggressive note as they penetrated the Kenyan defense twice in the first minute. India will look to their talismanic striker Sunil Chhetri as they face Kenya in the summit showdown of the Intercontinental Cup on Sunday. The world`s third-leading scorer, Chhetri have so far found the back of the net in each of the three games, including a hat-trick against Chinese Taipei and a brace against Kenya. The tournament is being used by hosts India as a preparatory ground for the AFC Asian Cup, to be held in January next year, and a win in the final will surely boost their confidence going ahead. India had blanked Kenya 3-0 in the league game at the Mumbai Football Arena, which was skipper Chhetri`s 100th appearance in national colours. And the India captain made the game memorable by scoring a brace. They will look to replicate the performance of their league game against the African side again in the summit clash, which the organisers have claimed to be a `sold out` match. The hosts are the side to beat this tournament as they have throughout played an aggressive brand of football. But the Stephen Constantine coached team cannot take Kenya lightly as they have defeated New Zealand 2-1 and blanked Chinese Taipei 4-0 last night. Constantine will ensure that his best playing XI will take the field after his strategy of making seven changes initially in the game against New Zealand backfired as the team lost 2-1. 4. 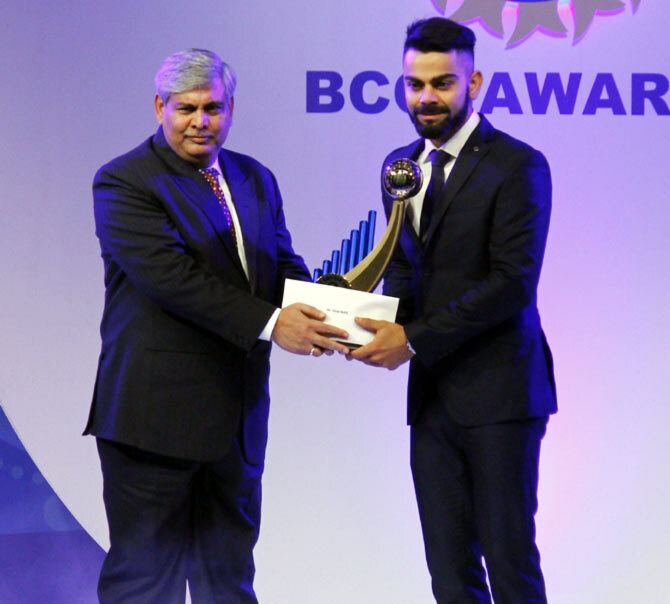 Virat Kohli Receives Polly Umrigar Trophy At Annual BCCI Awards. The Indian skipper, who has been in prolific form, received the award for his stupendous performance during the 2016-17 and 2017-18 seasons. He is currently undergoing rehabilitation for a neck injury sustained during the IPL, which ruled him out of his much debated County assignment for Surrey. Kohli is expected to appear for a fitness test at the NCA on June 15. The Awards function was also attended by the Afghanistan national team which will take on India in their first ever Test match, starting Thursday. Former England captain Kevin Pietersen, who delivered the key note address for the MAK Pataudi Memorial lecture, was also present. It was an evening in which the past and the current generation of Indian cricketers came together under one roof. Anshuman Gaekwad and Sudha Shah received the CK Nayudu Lifetime Achievement award. The domestic cricketers got their due recognition as Jalaj Saxena, Parvez Rasool, Krunal Pandya were all feted for their consistent domestic performances. Jalaj and Rasool were adjudged ‘Best All Rounders` in Ranji Trophy while Krunal was rewarded for his performance in the Hazare one-day championship. However, Krunal did not turn up to receive the award as he is on national duty with the India A team. 5. Sulabh Founder Honoured With Japan`s Nikkei Asia Prize. Noted social reformer and founder of Sulabh International, Bindeshwar Pathak, was today honoured with Japan’s prestigious ‘Nikkei Asia Prize for Culture and Community’ for his significant work in tackling poor hygiene and discrimination. Launched in 1996, the award honours people in Asia who have made significant contributions in one of the three areas: regional growth; science, technology and innovation; and culture and community. Former Prime Minister Manmohan Singh and Infosys Chairman Narayan Murthy are among the few Indians who have won the prize in the past. “This award will be another milestone in my commitment to service of the society in Asia in particular and world in general,” said 75-year-old Pathak while receiving the award from Chairman of the Award Committee Fujio Mitarai at a ceremony here. He dedicated the prize to the downtrodden section of the society, according to a statement by the Sulabh International. Mitarai said Pathak was bestowed with the honour for “tackling two of his country’s biggest challenges — poor hygiene and discrimination“. Pathak’s two-pit pour-flush ecological compost toilets have helped provide low cost environment friendly toilets to millions of people in the developing world. They have also ensured the safety for rural women and freedom from the manual labour. The award was given under ‘Culture and Community’ category. The other two winners were Ma Jun (Economic and Business Innovation), a Chinese environmentalist, for using the power of the internet to promote cleaner industry and Professor Nguyen Thanh Liem (Science and Technology), a Vietnamese doctor, for bringing cutting-edge medicine to children. Prime Minister Of Japan Shinzo Abe Day met the winners on Tuesday. The awards were created and presented by Nikkei Inc, one of the largest media corporations in Japan.